With the prevalence of social media and the obsession to explore the weird and wonderful, videos have emerged of food consumption that leaves many revolted and shocked. This led us to discuss what live food ingredients are available and consumed around the world? 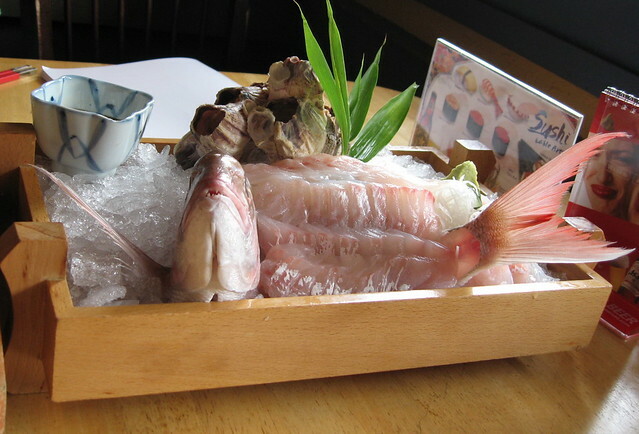 As far as seafood is concerned there are a number of ingredients which are popular in Asia. In Korea octopus is cut into pieces, lightly seasoned in sesame oil and served immediately. This dish is known as Sannakji. Similarly, sea urchins are eaten raw; the Japanese prepare a sushi dish ‘uni’. Also in Japan, sashimi is prepared using live fish, octopus, shrimp or lobster from which the inedible innards are removed. The technique is known as ‘ikizukuri’ (‘prepared alive’). In China carp is cooked while the fish head is wrapped in a damp cloth to keep it breathing. The dish is known as Ying Yang Yu fish (‘dead and alive fish’). The Chinese are also fond of a dish known as ‘drunken shrimp’ whereby freshwater shrimps are immersed in ethanol before being eaten. A similar dish can be found in Japan whereby live prawns are beheaded before being consumed. This dish is known as Odori Ebi (‘dancing fish’). Another version, Qiang Xia, entails using clawed river shrimp which are soaked in a spirit, such as baiju followed by marinating in a sauce which can be sweet, sour or salty. Eels doused in vinegar and sake are eaten when alive in Japan. In the West, oysters, are consumed fresh and until the oyster is removed from its shell it remains alive for a significant time. Similarly ‘live’ blood clams are a delicacy in New England, USA. Amphibians and reptiles are also consumed alive in countries such as China, India, Japan and Vietnam. Frogs are served as sashimi, beating snake hearts are considered a delicacy and lizards are known to be eaten too. Insects provide an alternative live food source. In Australia larvae such as the wichetty grub are consumed. 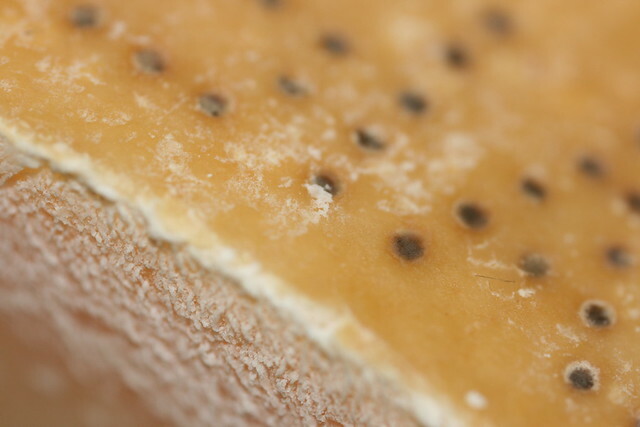 Casu Marzu a sheep’s cheese speciality in Sardinia embraces the larvae of the cheese fly, Piophila casei. In Denmark, the two Michelin starred restaurant, Noma, received much attention when offering chilled ants on its menu. Finally, some mammals are subject to being eaten alive; San Zhi Er (‘three squeaks’) is the practice of eating baby rodents in China and fruit bats have been traditionally eaten in Guam. Cuisitive wishes to state that eating live food is subject to significant health risks and further, raises an important ethical issue given that there is evidence that animals featured in this article can feel pain and stress. You may be familiar with the sachets of soy (or soya) sauce that come as an accompaniment to take-away food. Beyond this concoction of corn syrup, water, salt, caramel colour, vegetable protein, and sodium benzoate there is an enticing variety of soy sauces made by varied methods and offering a range of interesting and subtly different flavours, aromas and textures. Asia is the origin of soy sauce and we feature here some of the varieties produced in the far East that we would encourage you to seek out. 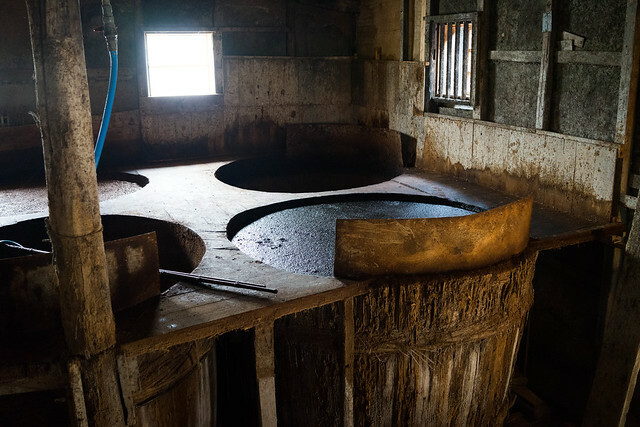 Chinese soy sauce can be broadly split into two methods of production: brewed or blended. Shēng chōu (“fresh drawn”) or Jiàng qīng is a light fresh, thin, opaque sauce brewed by first culturing steamed wheat and soybeans with Aspergillus oryzae molds followed by fermenting the mixture in brine. It is primarily used for seasoning. Tóu chōu is a ‘premium’ light soy sauce made from the first pressing of the soybeans as the flavour of the first pressing is considered superior. Primarily used for seasoning light dishes and for dipping due to its delicate flavour. Shuāng huáng is a light soy sauce with a more complex flavour as a result of double fermentation using the light soy sauce from another batch to take the place of brine for a second brewing. This adds further complexity to the flavour. Used primarily for dipping. Yìn yóu is a darker soy sauce produced by steamed soybeans with aspergillus mixed with coarse rock salt before undergoing prolonged dry fermentation. The flavour is complex and rich and is used for dipping or in “red” (hong) cooking. Brewed primarily in Taiwan. 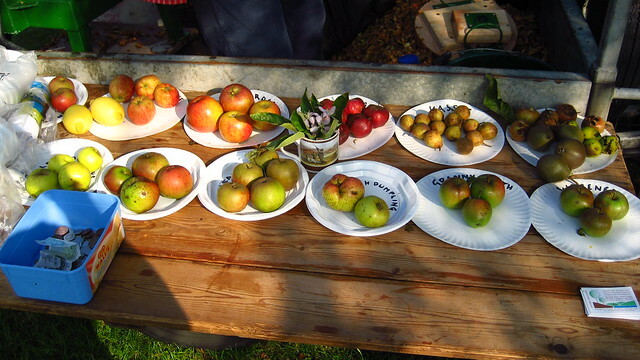 There are four notable varieties. Lǎo chōu (“mature drawn”) is a darker and slightly thicker sauce made from light soy sauce as a result of prolonged ageing and may contain added caramel colour and/or molasses to give it its distinctive appearance. Used mainly during cooking, as its slightly sweeter and less salty flavour is enhanced by heating. Cǎogū lǎochōu known as “mushroom” dark soy. Straw mushroom (Volvariella volvacea) is mixed into dark soy sauce creating a richer flavour. Jiàng yóu gāo is a dark soy sauce that has been thickened with starch and sugar and occasionally flavoured with spices and MSG. Used as a dipping sauce in red cooking because of its its sweetness and caramelised flavours. Xiā zǐ jiàngyóu known as “shrimp” soy sauce. It is a fresh soy sauce which has been simmered with fresh shrimp and finished with sugar, baijiu (a type of distilled liquor, 白酒), and spices. A specialty of Suzhou. Soy sauce (Shōyu) is traditionally divided into five main categories according to their ingredients and method of production. Normally wheat is a primary ingredient, which tends to give Japanese soy sauces a slightly sweeter taste than those associated with China. Also small amounts of alcohol acting as a natural preservative are sometimes added giving an alcoholic sherry-like flavour. Koikuchi (“thick taste”) is the typical Japanese soy sauce made from roughly equal quantities of soybean and wheat. Used in marinades as well as for dipping and in stir fries. Usukuchi (“thin taste”) is both saltier and lighter (arising from the use of amazake, a sweet liquid made from fermented rice). Particularly popular in the Kansai region. Used to season ingredients. Tamari is darker in appearance and richer in flavour than koikuchi. containing little or no wheat. Also known as miso-damari as this is the liquid that runs off miso as it matures. Made mainly in the Chūbu region. Used as a dipping sauce. Shiro (“white”) has a light appearance and sweet taste as it is made mostly of wheat and very little soybean. Used in the Kansai region as a dipping sauce for sashimi. Saishikomi (“twice-brewed”) is much darker and more strongly flavoured as a result of replacing the saltwater brine in the fermentation stage of koikuchi with a previous batch of already brewed soy sauce. Also known as kanro shōyu or ‘sweet soy sauce’. Honjōzō (“genuine fermented”) contains 100% genuine fermented product. Kongō-jōzō (“mixed fermented”) contains genuine fermented shōyu mash mixed with 30–50% chemicals or enzymatic hydrolysate of plant protein. Kongō (“mixed”) contains Honjōzō or Kongō-jōzō shōyu mixed with 30–50% chemicals or enzymatic hydrolysate of plant protein. Hyōjun ((Standard grade (more than 1.2% total nitrogen)), Jōkyū ((Upper grade (more than 1.35%)), Tokkyū ((Special grade (more than 1.5%)). Soy sauce varieties are produced in a number of other Asian countries. In Indonesia there are three main varieties of Kecap. Kecap manis is a sweetened soy sauce with a thick syrupy consistency and a treacle-like flavour arising from the addition of palm sugar, star anise, galangal and other aromatics. Used as a flavouring. Kecap manis sedang is a medium sweet soy sauce, less thick in consistency, less sweet and has a saltier taste than kecap manis. Kecap asin is derived from the Japanese shoyu but is usually more concentrated with a darker colour and stronger flavour. In addition there is Hakka soy sauce which is made from black beans and is very salty. In Korea soy sauces or ganjang (“seasoning sauce”) can be divided into two categories: hansik ganjang (Korean-style soy sauce) and gaeryang ganjang (modernized soy sauce). Hansik ganjang made entirely of fermented soybean (meju) has a distinctive fermented soybean flavour. It is lighter in colour and saltier than other Korean ganjang varieties. Jaerae-hansik-ganjang (“traditional Korean-style soy sauce”) – made with traditional style meju and brine. Gaeryang-hansik-ganjang (“modern Korean-style soy sauce”) – made with nontraditional meju (which can be made of regular soybean, rice, barley, wheat, or soybean meal, and ripened using traditional method or aspergillus) and brine. Haet-ganjang (“new soy sauce’) – aged for a year. Also called cheongjang (‘clear soy sauce’). Jung-ganjang (“middle soy sauce”) – aged for three to four years. Jin-ganjang (“dark soy sauce”) – aged for more than five years. Also called jinjang (‘aged soy sauce’), nongjang (‘thick soy sauce’), or jingamjang (‘aged mature soy sauce’). Gaeryang-ganjang (“modernised soy sauce”) i.e. sauces not made of meju, is now the most widely used type of soy sauce in modern Korean cuisine. Also known as Jin-ganjang (‘dark soy sauce). Gaeryang-ganjang is classified into four categories by method of production. Brewed soy sauce – made by fermenting soybean, soybean meal, or other grains with saline solution. Acid-hydrolyzed soy sauce – made by hydrolyzing raw materials containing protein with acid. Enzyme-hydrolyzed soy sauce – made by hydrolyzing raw materials containing protein with enzyme. Blended soy sauce – made by blending hansik-ganjang (Korean-style soy sauce) or yangjo-ganjang (brewed soy sauce) with acid-hydrolyzed soy sauce or enzyme-hydrolyzed soy sauce. In the Philippines Toyò sauce is usually a combination of soybeans, wheat, salt, and caramel colour. It is thinner in texture and has a saltier taste than many of its Southeast Asian counterparts. 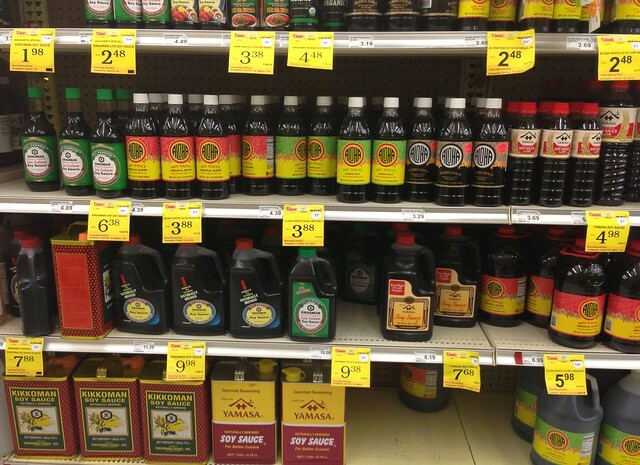 Varieties of soy sauce can be found also in Malaysia, Thailand and Vietnam. Despite this not inconsiderable range of commercially available sauces artisanal soy sauce producers are developing new products including a fifty year old aged sauce but you will need to be patient as this will not be available until 2039! Jerky is a method of meat preservation in which fresh meat is dried to prevent the growth of bacteria. The origin of this process dates from the C16th when the Quechua tribe in South America boned and removed the fat from alpaca and llama meat. It was then cut into slices, pounded and rubbed with salt before being sun-dried or smoked. The Quechua word ch’arki means to burn (meat). After the Spanish conquistadors arrived Ch’arki became Charqui. In North America native tribes employed a similar process drying the meat of deer, elk and buffalo and after the arrival of the Spanish the term ‘Charqui’ was embraced but became modified to Jerky. Jerky was originally a staple foodstuff to be eaten when other food was scarce. 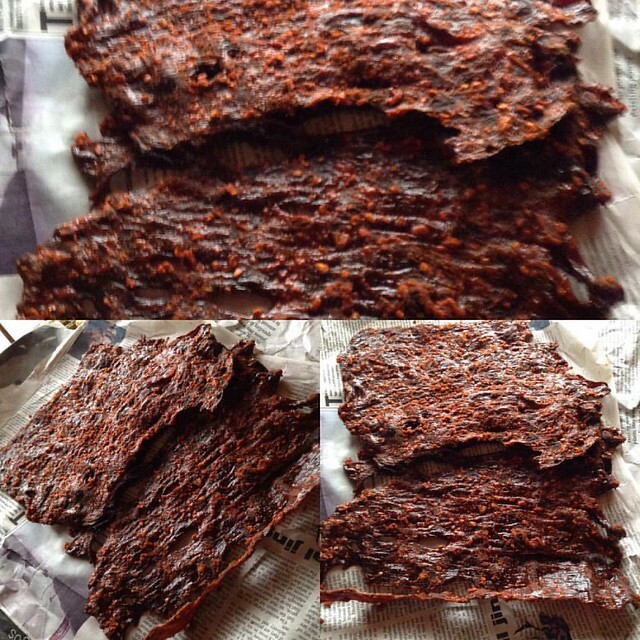 Since then with the addition of various spices and other flavours jerky has become a desirable tasty snack rather than eaten out of necessity. Modern manufactured jerky is normally marinated in a seasoned spice rub or liquid, and dried, dehydrated or smoked with low heat. A wide range of meats are used including alligator, beef, deer, kangaroo, ostrich, wild boar and yak as well as various kinds of fish; salmon, trout and tuna. Many ingredients including brown sugar, soy, garlic, chilli, lime are now used to enhance flavour. 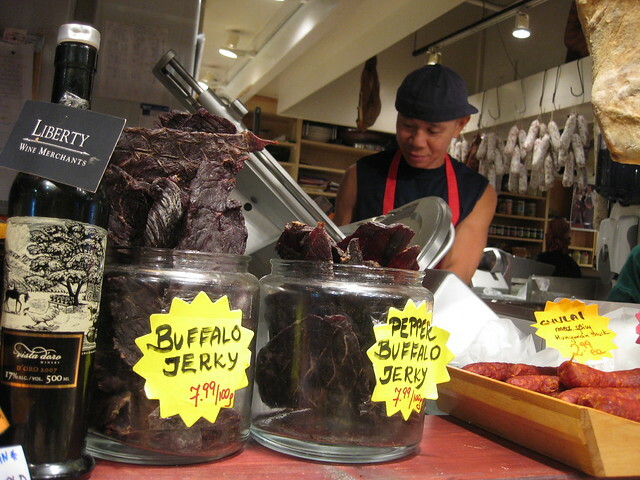 Jerky should not be confused with other dried meat products such as pemmican, kilishi, biltong, bakkwa and pastirma. Pemmican, another Native American product consists of dried meat that is pounded into small pieces and then mixed with melted fat and ground berries such as cranberries and Saskatoon. Kilishi is a Nigerian product involving sun drying cow, sheep or goat meat which is then coated in a peanut based paste with spices and sometimes honey before further drying and roasting. 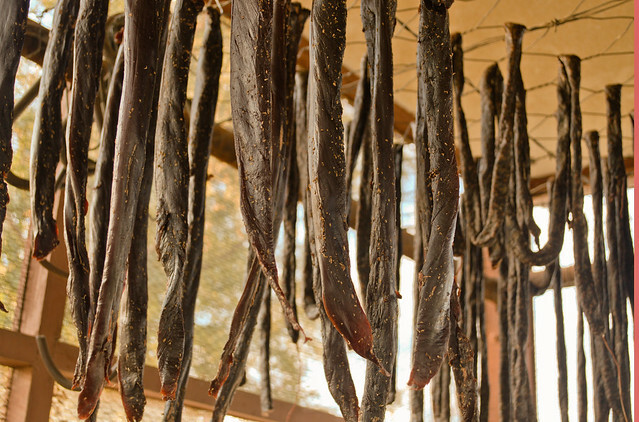 Biltong originating from South Africa is meat that is traditionally dried using vinegar and coriander to inhibit the growth of bacteria. 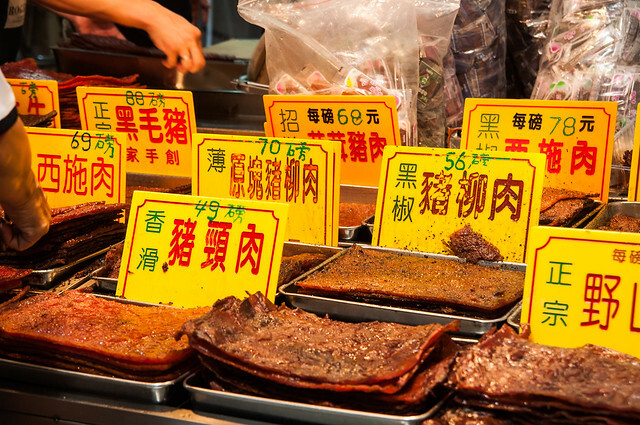 Bakkwa (Rougan) is a traditional Chinese preparation now produced in many Asian countries using beef, pork and mutton marinated with spices, soy, sugar and salt before being dried on racks. 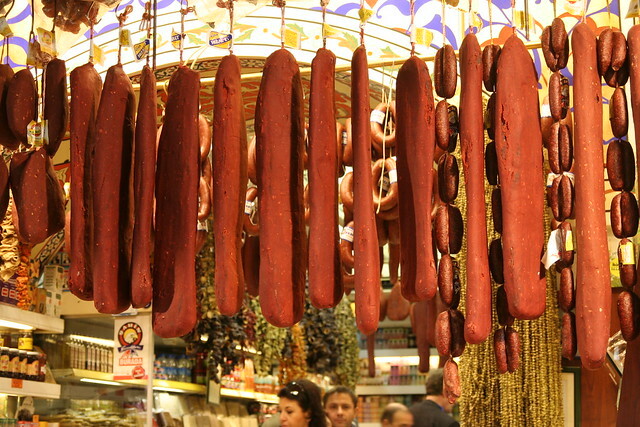 Pastirma is of Armenian origin and involves salting beef, then removing the blood and salt before covering with a cumin, fenugreek, paprika and garlic paste and air drying. A search of google will leave you thoroughly confused. Even amongst chefs that are famous for their use of spices, the answer is inconclusive. The aromatic quality of spices really depends on many factors. The freshness, storage and form principally. As a general rule it is not a bad idea to toast whole spices for a short time in a pan as it can release a bit more flavour. Although slightly controversial, at Cuisitive we prefer to toast spices in a little oil, leading to some of the essential oils getting trapped and thus not losing crucial flavour. By dry roasting a spice, a lot of the essential oil is lost through evaporation. The key to any toasting is to treat the spices with respect and avoid burning at all costs. A spice can go from aromatic to charred in seconds. Very similar to garlic when it hits the pan. Constantly move the spices around with a wooden spoon until they have darkened slightly and then remove from the heat. Generally with powdered spices like Garam Masala we do not toast them at all. Because of the fine texture the risk of burning is so great and really there is little flavour benefit to doing it. Whether you toast or not, really is up to you. Either approach has its benefits and drawbacks. The fact that in India most recipes are split down the middle between those that do and don’t toast says it all. As long as spices are treated with care and attention you will produce great results. Most people do not know or even realise there is a difference between a sweet potato and a yam. If you are in the UK the word yam does not even enter your lexicon. What the Americans often call a yam is a sweet potato there. On the off chance you find a real yam it will most likely be in an ethnic market of a big city with a large population from other countries. The reality is that most Americans and Europeans in fact anyone from the northern hemisphere has actually never had a true yam before in their life. Sweet potato and yam are both tuberous root vegetables that grow as a flowering plant but they are NOT related. Coming from Africa and Asia, Yams can be quite small or extremely large in size. 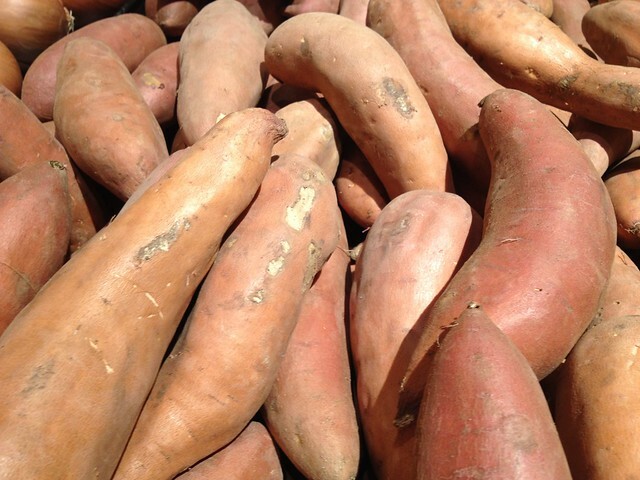 One major difference between a yam and a sweet potato is the former is much drier and starchy. They belong to the Lily family. 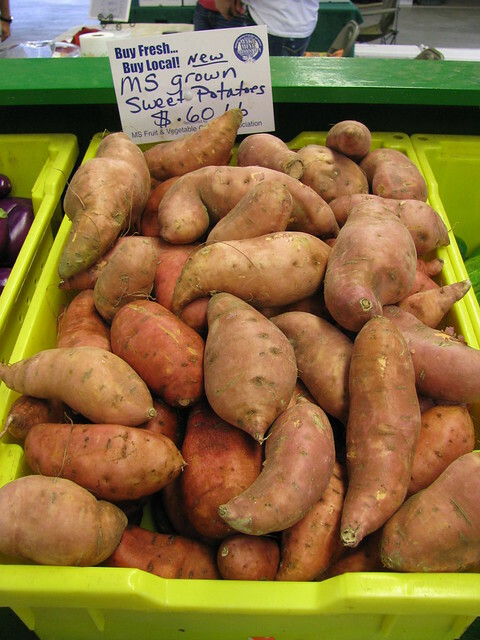 It has a rough skin (almost scaly) and notably low amounts of beta-carotene compared to the sweet potato. If you find a true yam in a US market its most likely been imported from the Caribbean. Sweet potatoes are part of the Morning Glory family. Skin colour can range from lighter varieties (white and yellow) to darker (red, purple and brown) with the same spectrum of flesh colour variety. They are distinctive because of their elongated shape and tapered ends. It is said the confusion of calling sweet potatoes as yams arose because of the need to differentiate the soft varieties from the firm varieties. It might have been a better idea to name the latter ‘softer’ sweet potato in hindsight. A basic distinction can be made if you are going to shop for them in the US. Yam — Soft sweet potato with a copper skin and deep orange flesh. Sweet potato — Firm sweet potato with golden skin and lighter flesh. Different sweet potatoes cook differently. After cooking firm sweet potatoes still remain firm and a little waxy, while the soft variety becomes creamy, fluffy, and moist. So to avoid problems when buying your yams/sweet potatoes take into account how you will be using it and then decide with your eyes and touch which is for you. The semolina is sprinkled with water and rolled with the hands to form small pellets, sprinkled with dry flour to keep them separate, and then sieved. Any pellets which are too small to be finished granules of couscous and fall through the sieve are again rolled and sprinkled with dry semolina and rolled into pellets. This process continues until all the semolina has been formed into tiny granules of couscous. This process is labour-intensive. In the traditional method of preparing couscous, groups of women came together to make large batches over several days, which were then dried in the sun and used for several months. Couscous was traditionally made from the hard part of the durum, the part of the grain that resisted the grinding of the millstone. In modern times, couscous production is largely mechanized, and the product is sold in markets around the world. In the Sahelian countries of West Africa, such as Mali and Senegal, pearl millet is pounded or milled to the size and consistency necessary for the couscous. A couscoussier, a traditional steamer for couscous. Properly cooked couscous is light and fluffy, not gummy or gritty. Traditionally, North Africans use a food steamer (called aTaseksut in Berber, a كِسْكَاس kiskas in Arabic or a couscoussier in French). The base is a tall metal pot shaped rather like an oil jar in which the meat and vegetables are cooked as a stew. On top of the base, a steamer sits where the couscous is cooked, absorbing the flavours from the stew. The lid to the steamer has holes around its edge so steam can escape. It is also possible to use a pot with a steamer insert. 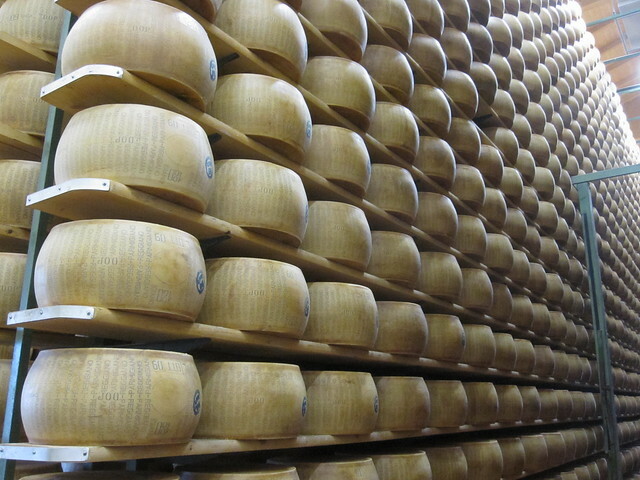 If the holes are too big, the steamer can be lined with damp cheesecloth. There is little archaeological evidence of early diets including couscous, possibly because the original couscoussier was probably made from organic materials which could not survive extended exposure to the elements. When we think of Filo pastry Baklava comes to mind for most of us. While this super sweet pastry is the most well known and earliest dish, Filo is used in dozens of other equally special and delicious dishes. Filo is a very thin unleavened dough used for making pastries with likely origins from the Ottoman empire. Its name in English comes from Greek translated as ‘leaf’. HOW TO MAKE FILO DOUGH? Filo is based on a mix of flour, water, raki or white vinegar and oil. The art of great filo relies on the ability to create extremely thin perfect sheets rolled out on a very big table. The trick is to use flouring to prevent tearing. These days the art of handmade filo is being replaced by specialized machines but the technique is still exhibited in homes and traditional restaurants across the Middle East and the Balkans along with immigrant communities globally. To create the familiar flaky layered delicate texture of filo, each layer is stacked with melted butter used as a form of glue. What’s the difference between filo, puff and croissant doughs? Essentially the latter two are created by stacking thick layers of dough covered in butter and then folded. The mixture is then rolled out to form a pastry that has the butter well dispersed into the dough. The huge variety of filo pastries include. Baklava – The most famous use for filo. Layers filled with chopped nuts and syrup/honey. Banitsa – A Bulgarian dish of whisked eggs and cheese baked between filo pastry. Börek – A general term for a large range of baked filled pastries found through the Middle East, Balkans and Mediterranean. They can be filled with cheese, meat and vegetables. Bougatsa – Greek breakfast pastry. Filo filled with semolina custard, cheese or minced meat. Gibanica – A Serbian dish made from filo, white cheese, and eggs. Pastizz – A savory pastry from Malta filled with ricotta or mushy peas. Spanakopita – A Greek spinach pie. Zelnik – A savory pie from the Balkans.